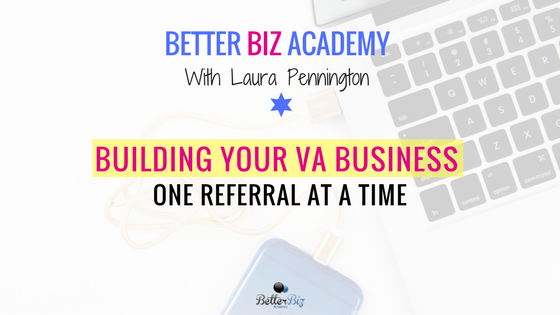 This week, I am sharing a tip that is specific to virtual assistants (but can really help freelancers of any type), and that is using referrals to build your business one client at a time. One of the hardest things to do as a new virtual assistant or freelancer is to get your very first client. It's often the hardest to do this because you feel a lack of confidence about what you're doing and you're not sure of the marketing channels that are going to bring you the most business and the most qualified business to build your company. So that lack of confidence really translates to how you market and the type of clients that you land. But the first couple of clients that you work with are really important for your credibility because they can lead to multiple referrals or even testimonials that land you future work. Even if you're doing one-off projects or a situation where the client asks you to work on a particular project from beginning to end and then has you wrap up with them, that doesn't mean that all of the money-making potential with that client is over with. Clients can be a really powerful source of referrals and testimonials. I'll give you a great example of how this has worked out for me in my virtual assistant and freelance writing business. It's happened time and time again that a client that I worked with once or even a client who maybe wasn't one of my highest paying clients or my biggest gigs month to month, would refer me to someone else that opened the door to something amazing. That's how I went from doing my first couple of virtual assisting gigs to landing a job as a project manager for True Car, Microsoft and several other companies where I was managing big teams of freelancers. All those experiences stack on top of each other and open doors because of referrals and testimonials. Clients who have a positive experience working with you now are much more willing to refer you to someone else. One of my favorite ways that I witness this often is when someone posts in a Facebook group that they're looking for a virtual assistant to help with a particular task. Inevitably, there will be five or ten people who tag someone else in the comments to that Facebook post. That's a direct referral and a recommendation from someone else. That kind of social proof goes a long way when you're a new virtual assistant or freelancer of any type because it's hard to give a stranger over the internet your money. Bringing on a new team member, especially if it's the client's first hire as a virtual assistant, is a nerve wracking experience. They want to know that they're going to get high quality and what they expect for what they're paying. But having someone else jump in and say, 'Hey, I had a positive experience working with this virtual assistant, I can really recommend them as a go-to source of information and high-quality work'. - that speaks volumes to your potential clients. In the same way, positive comments from your clients on job platforms such as Upwork help other people see that clients have had a positive experience working with you and this can crack open the door for future work with those clients and other clients. You should never view a job you wrap up with a client as one-and-done because the potential for referrals and testimonials is always there. Sometimes you just have to ask. In many of these cases, clients don't know how important it is to a virtual assistant or freelancer to build on testimonials and referrals. But if they've been thrilled with the experience of working with you, they're much more likely to give you those testimonials and referrals. So you've got to be prepared to ask. When you finish up a job with a client or even while you're in an ongoing contract of retainer work with a client, let them know how much feedback and testimonials help you land other clients and how important it is to you that you're doing a good job for them. Usually they'll be more than happy to provide you with a couple of sentences about what it's been like to work with you. You can use this on your testimonials page, you can use this in a one sheet of all your best possible feedback. You can have this added to your LinkedIn profile and use it in so many different ways. It continues to pay off for you when other people have good things to say about your work and overall experience. You can use this to build your referral business one client at a time. Should You Hire a Business Manager? Here's What You Need to Know, Girlfriend.